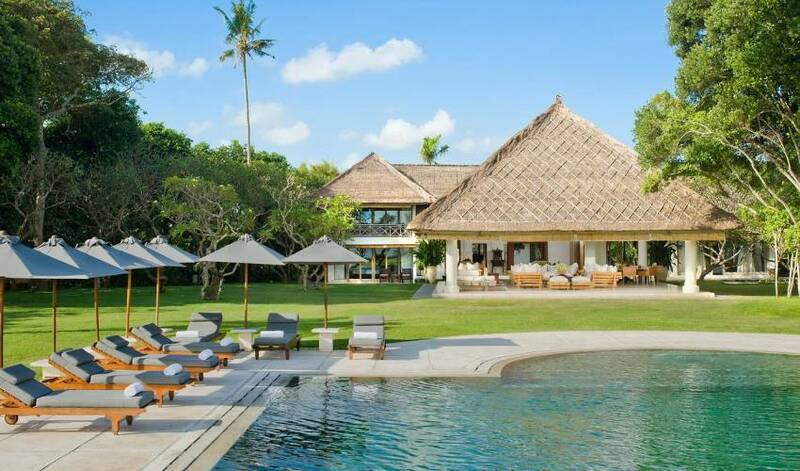 Commanding 100 metres of absolute beachfront and set in one and a half acres of gardens on Bali’s south-western coast, the Luxury Villa is in a class of its own. 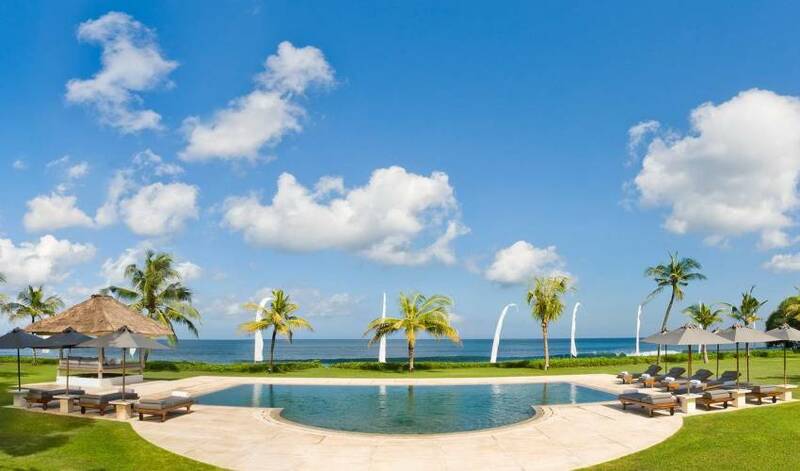 Much in demand as a wedding venue, this fully staffed, luxury destination villa is also ideal for extended family gatherings, offering five spacious bedroom suites, generous living and entertainment areas, and a large beach-edge swimming pool. 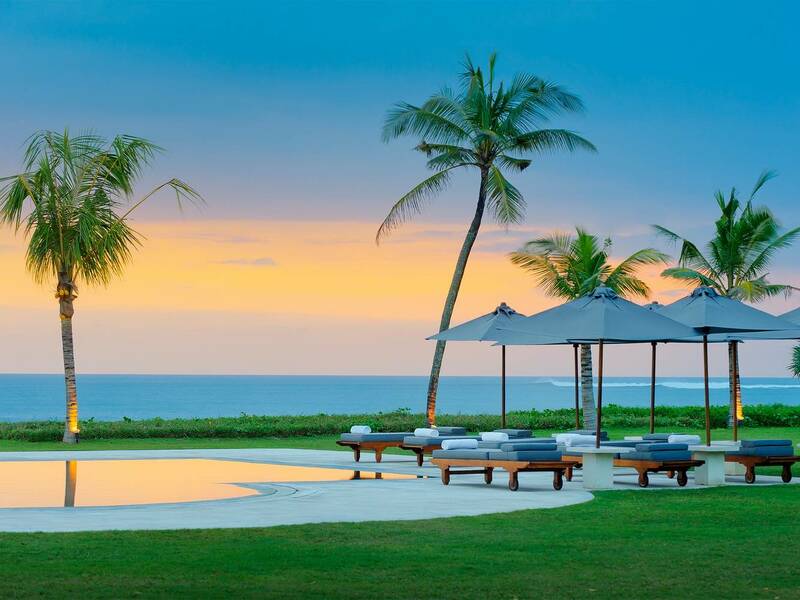 Guests will enjoy the privilege of an abundance of space and privacy and yet some of Bali’s coolest restaurants and bars are just a short stroll along the beach, and the boutiques and bright lights of Seminyak only four kilometres away. 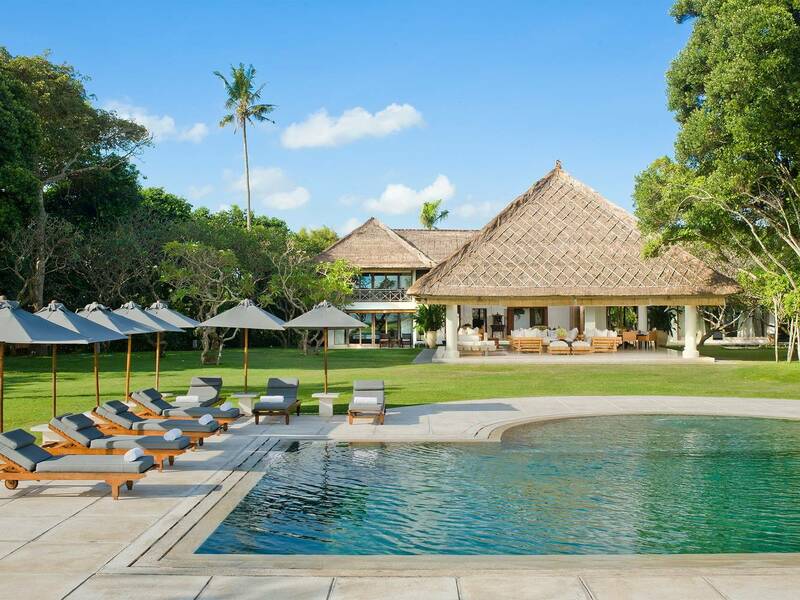 The villa’s living areas and five bedroom suites are housed in three alang-alang thatched pavilions that extend across the estate. All enjoy magnificent sea views, and the sound of the surf is a constant reminder of the villa’s pleasingly appropriate name, which means ‘top of the waves’. 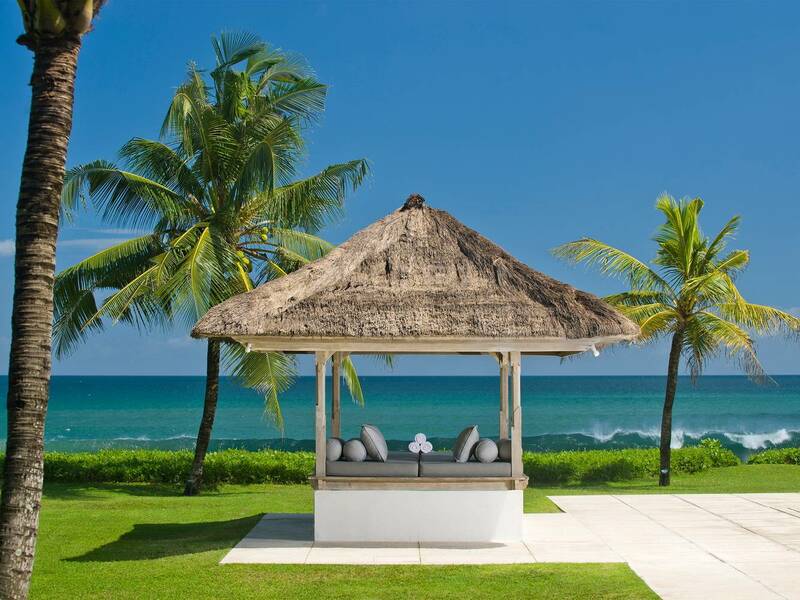 Every moment spent in this quintessential Bali beach retreat is full of magic: luxuriate in the shallows of the 14 x 7-metre pool or lounge in the shade of the deeply cushioned poolside balé; retreat to the sea-breeze-cooled living pavilion for a siesta; sip a cool drink on the beachside deck in the glow of one of Bali’s legendary sunsets; savour a gourmet dinner created by the accomplished chefs and served by charming, crisply uniformed staff in the candle-lit gardens. Little wonder this gorgeous villa has captured the hearts of so many newly-weds as well as the headlines of several lifestyle magazines. 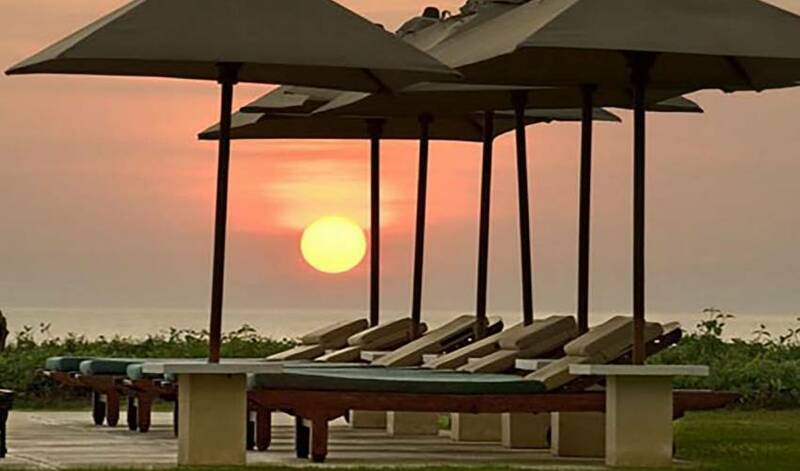 One of the delights of staying here is having such easy access to the beach –the scene of many of the sea-based rituals of Bali’s religious calendar. Walking a little further along the beach, you’ll come to La Lucciola, where you can enjoy the ambiance of this pioneer Bali beachfront restaurant. 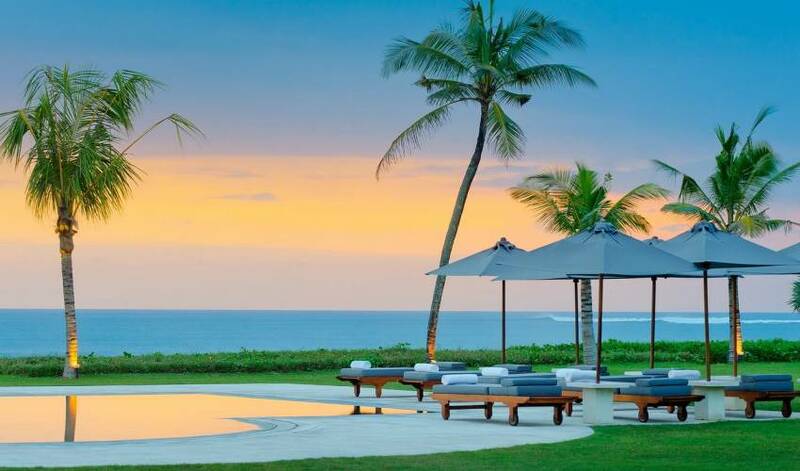 A stay in this Luxury Villa is truly living the Bali Dream! 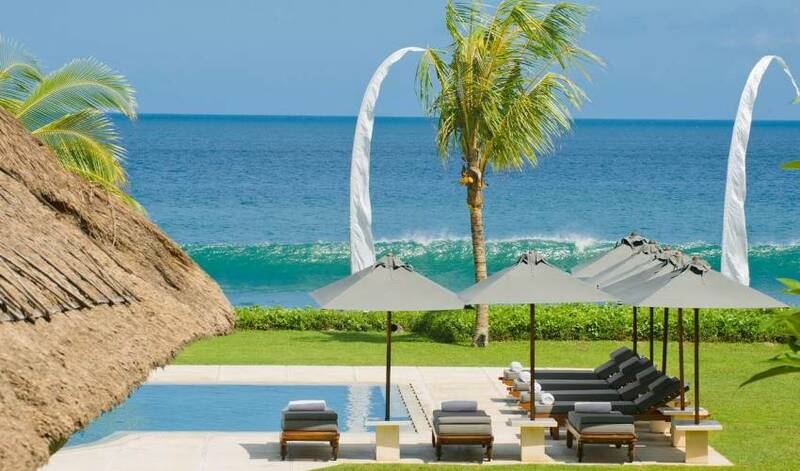 The Villa has been oriented to enjoy sublime ocean views from every room. Set well back from the beach for added privacy, the villa’s main building comprises a rather grand reception hall incorporating a formal dining area for 10; a TV room; the ground floor master suite; and two guest bedrooms, one above the other. Beyond the main building, heading towards the pool and beach, is a huge open-sided living pavilion with seating and dining areas, while on the beach edge is the guest pavilion with its two ocean-view suites. 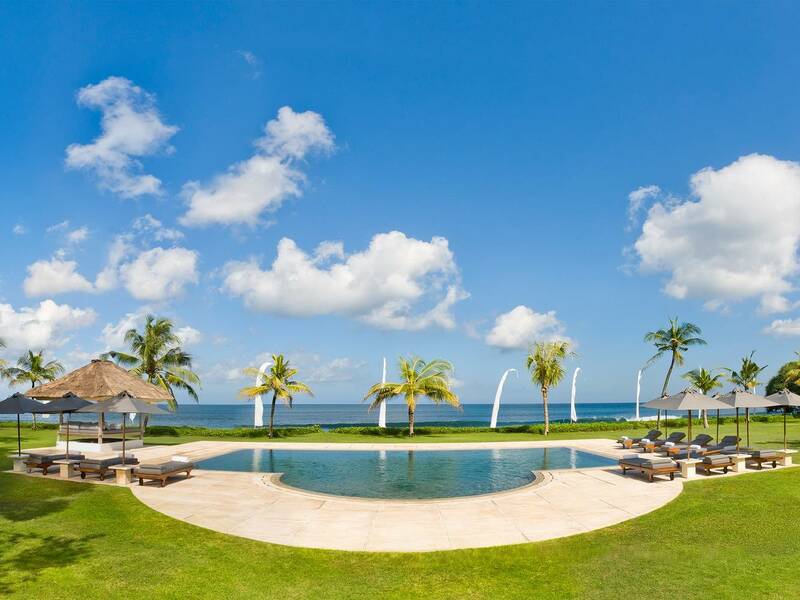 At the heart of this heavenly beachfront estate is the huge open-sided alang-alang thatched living pavilion cooled by the sea breeze and complete with remote control Bose surround-sound system. Even the oversized bamboo sofas are dwarfed in this massive entertainment space, which provides a wonderful dance floor for the many weddings hosted at the villa. A marble-topped dining table with comfy batik-cushioned rattan armchairs encourages social breakfasts and candlelit dinners. There’s a second, more formal dining area, with long table and ten comfortable armchairs, to the side of the soaring double-height reception hall in the main villa building – an elegant space that lends itself well to special events, and where tall tribal statues stand sentinel. Behind, across a decked walkway over the lotus pond is a professionally equipped kitchen where the staff prepares gourmet meals. Separated from the reception area by folding doors is the TV room, where an L-shaped leather sofa is set before an antique cabinet housing the TV, DVD player, iPod dock and a fine library of books. From here, a wall of sliding glass doors opens onto lotus ponds and more blissful ocean views. Within the extensive gardens are other spaces thoughtfully dedicated to quiet reflection, social gathering and serious sun worship. 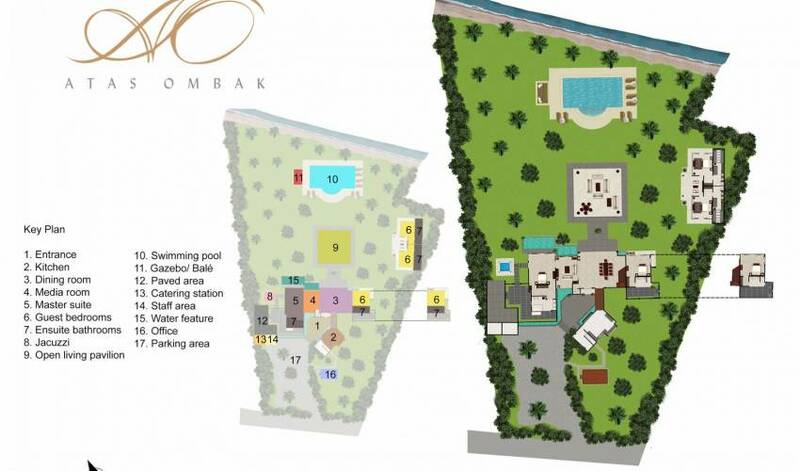 There are five bedroom suites – all light, spacious and with sweeping ocean views. The terrazzo floors, billowing white curtains and draped mosquito nets create a cool, clean colour palette, and comfort is assured with a choice of air-conditioning or ceiling fan, kimonos and slippers, top-quality King Koil mattresses, feather pillows and cotton linen on the beds (all king-size, with one converting to twins). A striking contemporary canvas commands attention in the beautifully furnished master suite, which offers such stunning views beyond its sliding glass doors that the satellite TV and DVD player may not get much use! Beyond the dressing area is a huge bathroom with private garden courtyard where guests can shower alfresco or sink into the hamam-style bathtub. Traditional Balinese doors lead from here to a covered jacuzzi plunge pool. The two guest bedrooms in the main house are simply furnished; their focus being on the glorious ocean views to the front, and the river to the side. Both have private terraces, dressing areas, and pretty bathrooms – one extending into a courtyard garden, the one above looking across a frangipani grove. 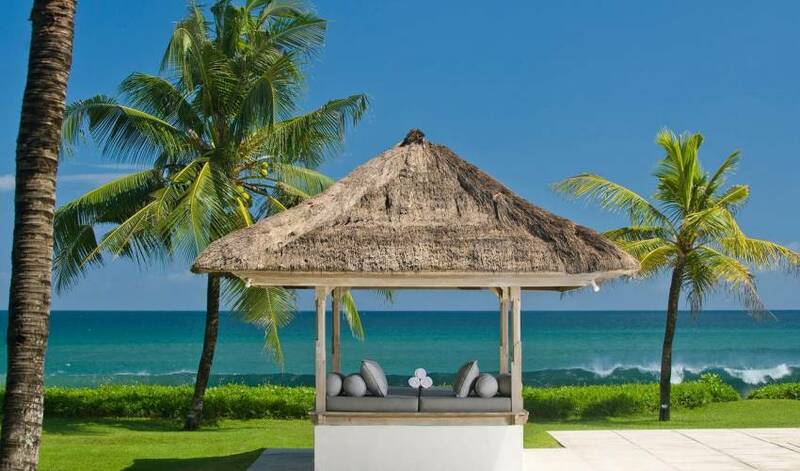 In a thatched pavilion close to the beach are two further guest bedrooms and a shared open-sided living area. With the ocean visible beyond the glass walls and interiors of whitewashed wood, these bedrooms have a cool beach vibe. Plantation shutters behind the bed reveal smart, ensuite bathrooms with black terrazzo bathtubs and alfresco showers. The Villa's location is second to none, with 100 metres of absolute beachfront and stunning ocean views from all over the estate. 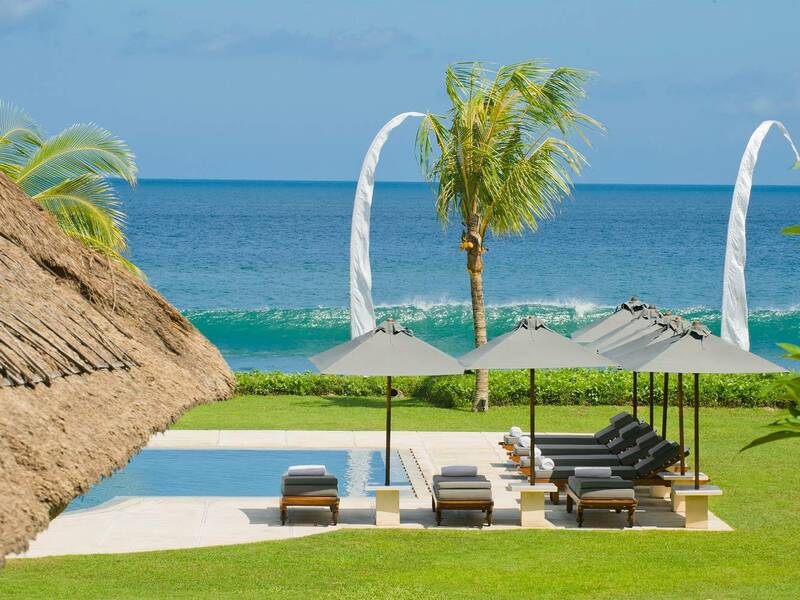 The villa’s privacy is protected by one and a half acres of mature gardens (bordered by the beach and a small river), but only steps away are the wild expanses of black-sand beaches that stretch to the horizon in either direction. 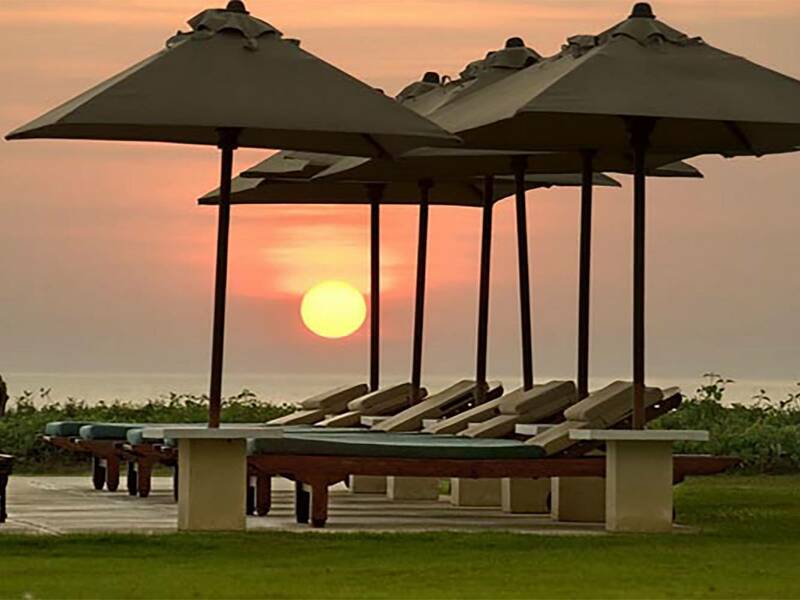 A pleasant stroll along the beach to the left brings you to Bali hotspots Mozaic Beach Club, W Hotel, Potato Head, La Lucciola and Ku De Ta, and only four kilometres away are the many boutiques, bars and restaurants of Seminyak.